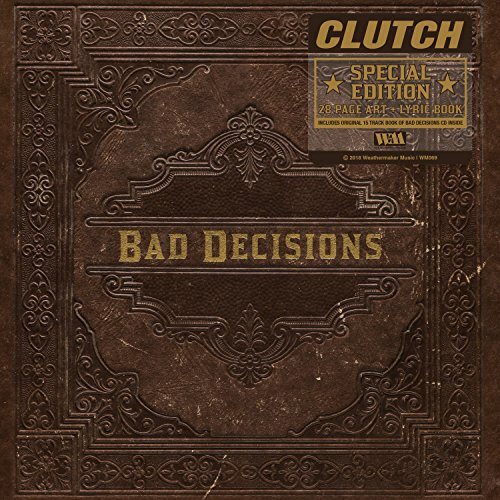 Maryland rockers Clutch is back at it again with the release of their 12th studio album, Book of Bad Decisions. Working with Grammy-winning Nashville producer Vance Powell who has worked with artist such as Jack White — the band has done it yet again with the release of another powerful, fun and classic Clutch album that we have come to love and expect. This is one band that has really held true to their sound over the years and I give them much respect for doing just that. Frontman Neil Fallon takes us for a wild ride through each track of the album with that grungy and dirty rock sound that is pure Clutch. In my personal opinion as a long-time Clutch fan I felt that some of the tracks do feel that they just keep going and never end and almost mash together and then other tracks really stand out with an eclectic mix of music and instruments… sometimes bands should remember that more is not always better. Nevertheless, even with some of the odd tracks the rest of the album is awesome and the band really takes pride and shows their true passion to deliver the sound and music that is Clutch. I think the approach to this album was different especially working with Vance from their previous album Psychic Warfare However even with the slightly different flavor to this I still enjoyed the album and first-look at fan ratings seem to be showing the same take on the album too….if you are a fan of the band you’ll like this album too.